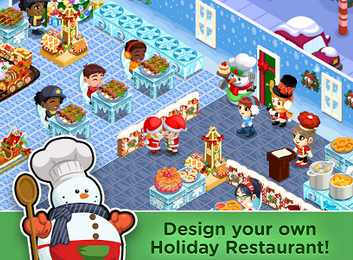 The Community is composed of everyone who plays Restaurant Story. You can help members of the Community by leaving them tips or writing an ecouraging comment on their walls. To find members of the Community, open the Social page from the Main Menu and tap the Community tab. From here you can view a list of several Community members and go to their restaurant by tapping the Visit button. Tipping another player will grant them bonus experience and coins and will increase your Star Rating. Your Star Rating is displayed at the bottom of the restaurant you are visiting and can range from 0 stars to a full 4 stars. A higher Star Rating increases your chances of appearing at the top of the Community list. Keep in mind that you can only tip a Community member's restaurant 3 times each day, so if you want to get a 4 Star Rating you will need to help several Community members or Neighbors (explained in the Playing With Friends section). To give a Gift to another player, you must first add them as a Neighbor. You can then send a Gift either directly through the Neighbors page by tapping the Gift button next to their name or by visiting a Neighbor's Restaurant and then tapping the Gift icon on the right side of the screen. When a Neighbor sends you a gift, a gift box icon will appear above the main menu icon on your main screen - the number next to this gift box is how many gifts you have waiting for you. Tap on the gift box to open it and accept or decline the gifts you've been sent. Accepted gifts will go to your Inventory and you'll be given an option to send a gift back to the Neighbor who sent you the original gift..